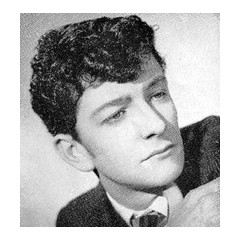 Dickie Pride (21 October 1941 — 26 March 1969), was a British rock and roll singer. He was one of Larry Parnes' stable of pop music stars, who did not enjoy as successful a career as most of his contemporaries. Pride was born Richard Charles Knellar in Thornton Heath on October 21, 1941. 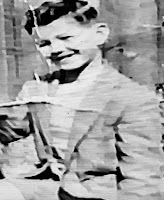 As a young boy he won a scholarship to the Royal College of Church Music in Croydon and had a fine operatic voice, but like many young men at that time, he preferred popular music and formed his own skiffle group called the Semi-Tones. He had several poorly paid jobs. While performing one night at the Castle pub in Tooting, South London, his singing was heard by Russ Conway, who was so impressed that he recommended him to Parnes, who signed him on the spot. 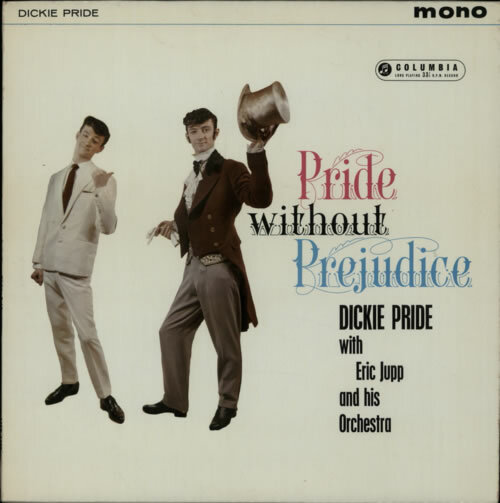 After the obligatory name change (which all of Parnes' singers had to do), he entered the professional world as Dickie Pride -- still only 16 years old -- with a first gig at the Kilburn Gaumont cinema, at that time the biggest cinema in the country. The Record Mirror wrote of his performance that "he ripped it up from the start," and he so shook up the theater that he became known as "the Sheik of Shake." This was followed by tours and television shows. Norrie Paramore signed him to the Columbia Records label and in March 1959 released his first single "Slippin' and Slidin'" (a cover of the song made famous by Little Richard). 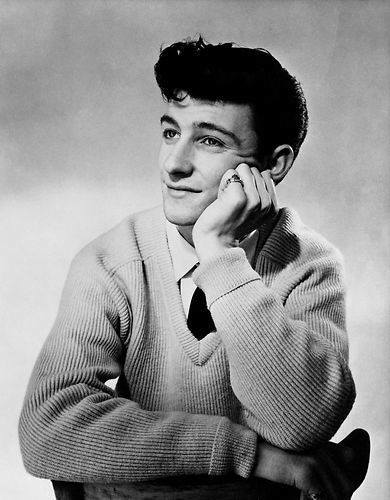 He made his TV debut on Jack Good's flagship pop music show “Oh Boy“ in February of 1959 in which he made several appearances. 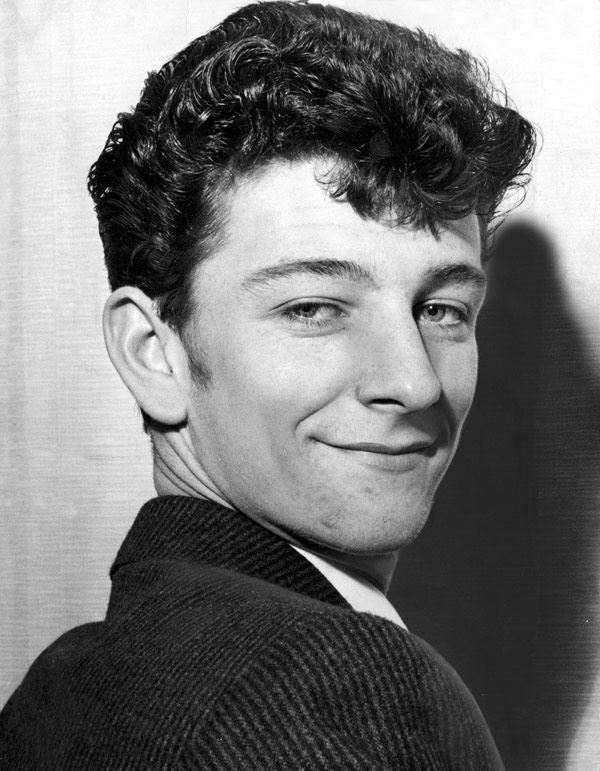 He performed in 'The Big Beat Show' at Southend with Marty Wilde, Billy Fury, Terry Dene, Johnny Gentle, Duffy Power and Sally Kelly Despite his live performances, with most of his subsequent recordings, commercially Pride was far below expectations. 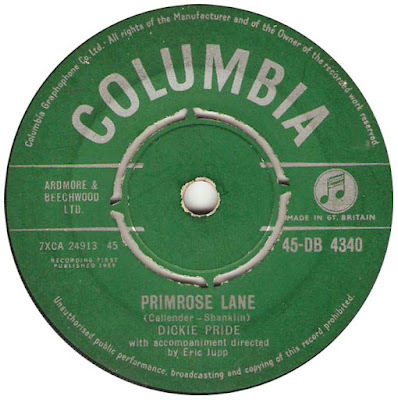 The only single of Pride's that ever made it into the Top 40 in the UK Singles Chart - "Primrose Lane" appeared in October 1959 for only one week in 28th place. 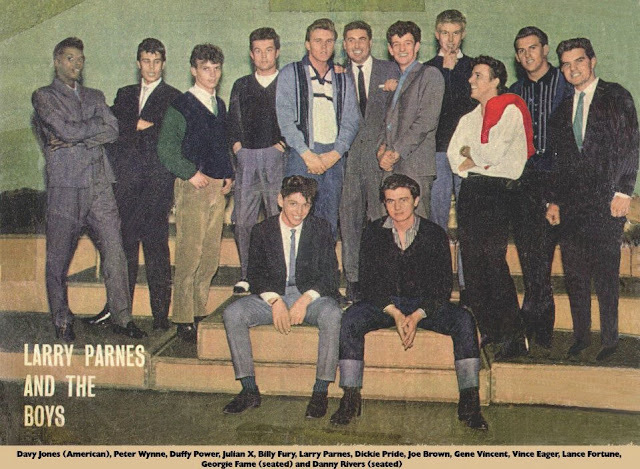 including Billy Fury, Joe Brown, Johnny Kidd & the Pirates, Jess Conrad, and the Vernons Girls. 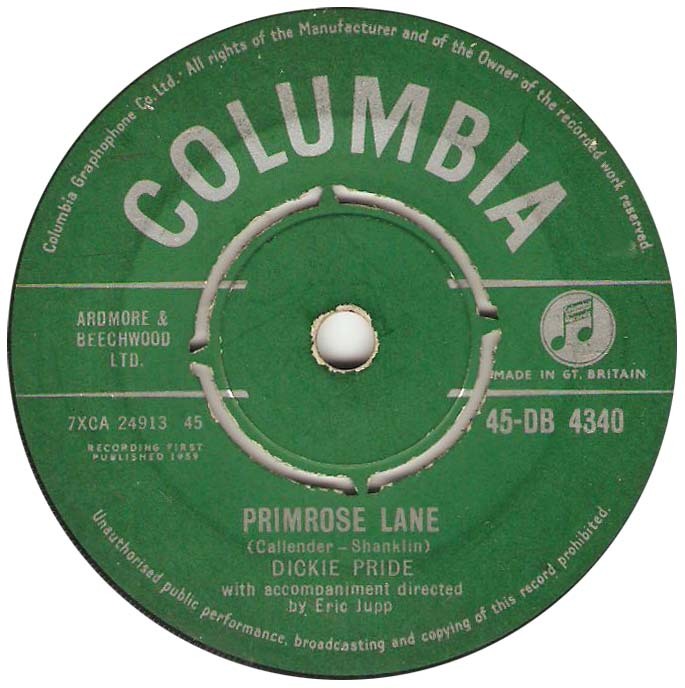 Pride was very successful during live performances but had difficulty transferring this success to his recordings. Unable to find a song that would launch him into the big time, Larry Parnes and Norrie Paramore supplied the song "Primrose Lane," a ballad that just scraped into the charts for one week at number 28 in October 1959, and despite his obvious talent for singing live, it never transferred successfully to recordings. One final attempt was made in 1961 with an album of Tin Pan Alley standards featuring Eric Jupp & His Orchestra called Pride Without Prejudice, the LP was intended to position him as a mainstream all-around entertainer. When it sold very badly, he was dropped by Larry Parnes. He was married in 1962 and found he could not make a living by singing, so he took up menial labor again. He attempted to start a band in 1963, but the group was short-lived. He and his wife were blessed with a son in 1965, and Dickie had started performing with a group known as the Sidewinders. Unfortunately, he fell deeper into heroin addiction. After a slow fall into depression and a family break-up, he was committed to a mental hospital in 1967. His doctors decided that what he needed was a lobotomy, and performed the operation. He was released and once again tried to make a living as a singer. Finding work and any sort of commercial success eluding him, he and died on March 26, 1969, just 27 years of age, from an overdose of sleeping pills. 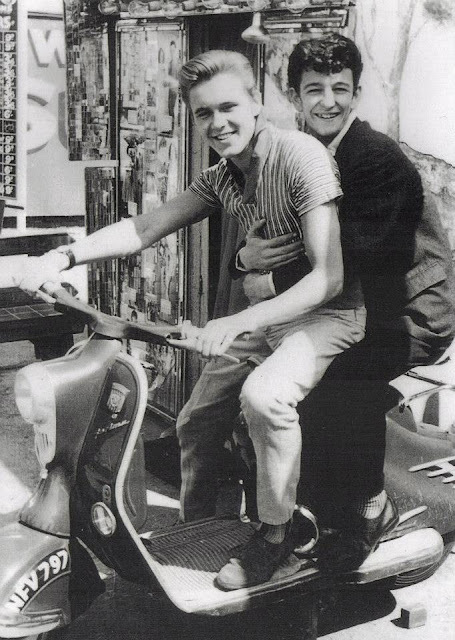 Many of the stable of Larry Parnes' artists, including Billy Fury and Joe Brown, were devastated, claiming that out of all of them, Dickie Pride had been the most talented and the best singer, but fate had decreed it just wasn't to be. In 1999, Charles Langley wrote the stage play, Pride With Prejudice, about Pride's tragic life. Here’s a clip taken from TV show “Oh Boy“ originally transmitted on 30/5/1959. 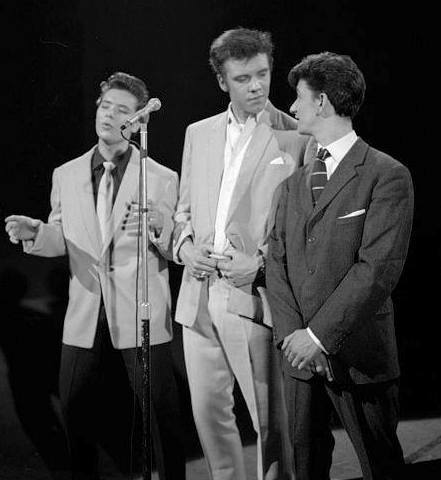 Cliff Richard, Marty Wilde and Dickie Pride sing 'Three Cool Cats' whilst three Vernon Girls dance to the song. A big thank you to Jake @ Jukebox City for ACTIVE link. Thanks for this reminder of my youthful days of package tours at the local cinema - a whole concert of Parnes Boys, either at the Harrow Granada or Dominion. Nostalgia rules, well at least whilst this one is playing. Bop on Bob.